This Million Dollar Cake is a light, refreshing cheesecake-style pudding cake, pulled from Nana’s handwritten vintage cookbook! 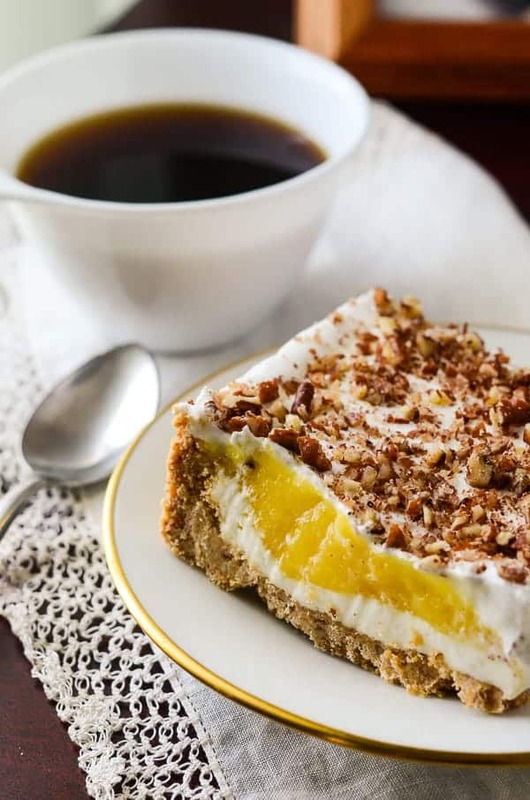 A buttery, nutty crust, easy vanilla pudding, and a cheesecake-based cream make up the delicious layer of this old-fashioned dessert. This week’s #SundaySupper is all about Nana and Papa, Grammy and Pepe, Nanny and Pop-Pop, Grandma and Grandpa: the sweet, loving, spoiling grandparents that made our childhoods so much fun. Even if you’re all grown up now, I promise they’re still fun! And now it’s your turn to spoil them, and I have just the cake to do it with – my Nana’s Million Dollar Cake, a treat famous in my family. JUST TAKE ME TO THE MILLION DOLLAR CAKE ALREADY! 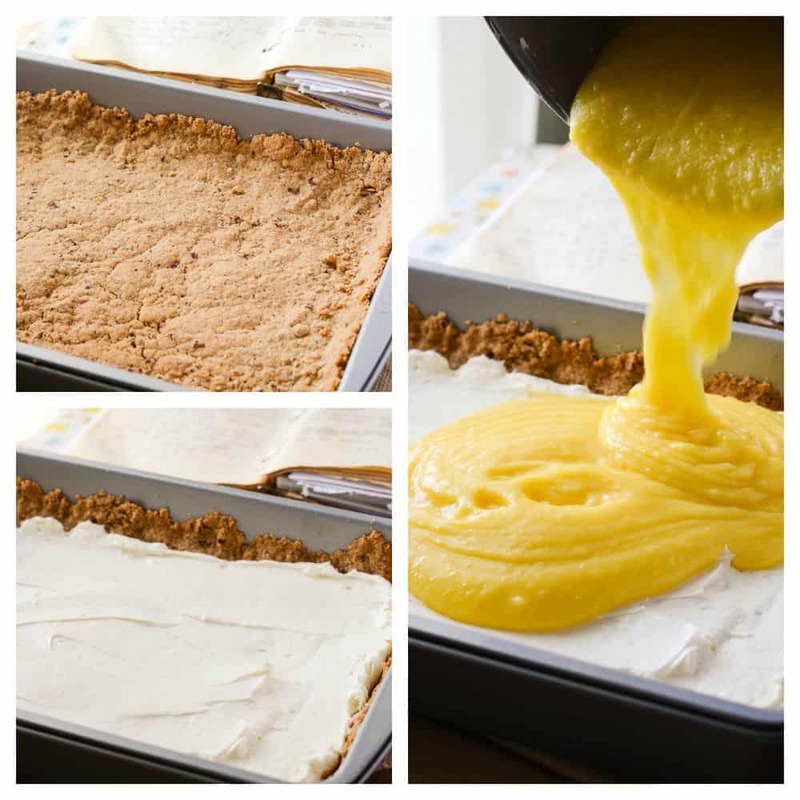 If you’d rather skip my (pretty darn helpful) tips and tricks, essential cooking info, and similar recipe ideas – and get straight to this deliciously easy pudding cake recipe, just scroll right on down to the bottom of the page where you can find the printable recipe card! In my eyes, Grandparents Day has always been on par with Mother’s and Father’s Days, but was most important since Nana (my Great-Grandmother) was both to me. I credit her with not only raising me but with instilling every good value I have. She taught me how to tie my shoes, and to show compassion; how to drive a car, and how to forgive. How to balance a checkbook, bake every cookie in her handwritten cookbook, and to love with all your heart. As I grew older, as any teenager, I stubbornly butted heads with her over many things. As with any parental authority situation, there were times we would very loudly disagree. But she was my Nana, and ultimately, I respected her more than any other human on the planet, and I quickly apologized and straightened up. In the long run, and probably without meaning to, she taught me how to know when to shut up, too. Hindsight is 20/20, and looking back on the twenty-one years that I had her in my life, I hope she knew how much I loved and appreciated her, and the lessons her life experience taught me. Losing her ten years ago was the hardest thing I’ve ever been through. Growing up, learning about death, and coming to the realization that she was getting to an age where she would leave me behind was rough, and even though I felt prepared to handle it, my world crumbled around me when it happened. She was my core family, and we were a team – and I don’t have to tell you how difficult it is to be alone on a team. I was supremely blessed to have her in my life for as long as I did, and I thank my lucky stars every day for the light she still brings to my life – I think of her every time I step into her kitchen…the one that I now call my own. Nana lived to be ninety years old, and in her near century on Earth, she drank three cups of coffee a day, ate ice cream every night, and had a hot food pyramid friendly meal on the table for her family at the end of every day, even when she had to go to work to help pay the bills during the Great Depression. 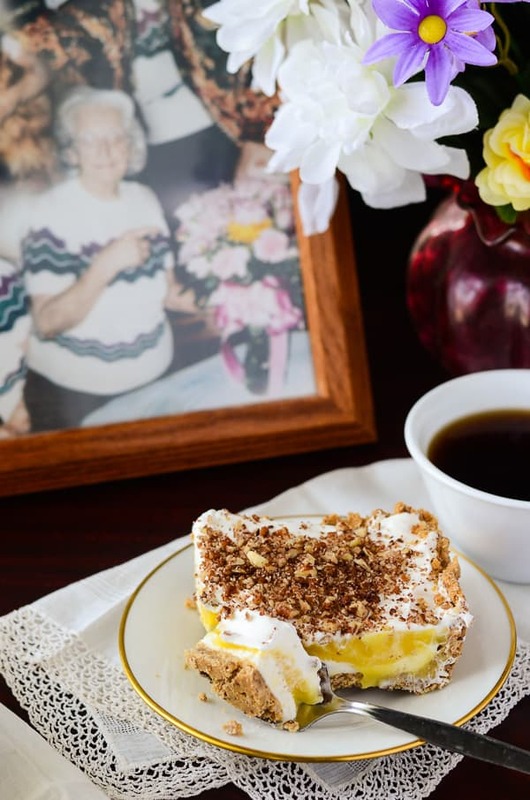 As a first-generation Polish-American, she had a lot of hearty, old-world recipes to draw inspiration from in her cooking, but she also loved to collect recipes from friends, coworkers, newspaper clippings, and television shows. The cookbook she left to me is full of them – some handwritten, many typewritten, but all things I grew up getting the chance to eat. The recipe for this Million Dollar Cake is one that I’ve seen floating around the internet, but from what I can tell from her notes, she got it from her sister. 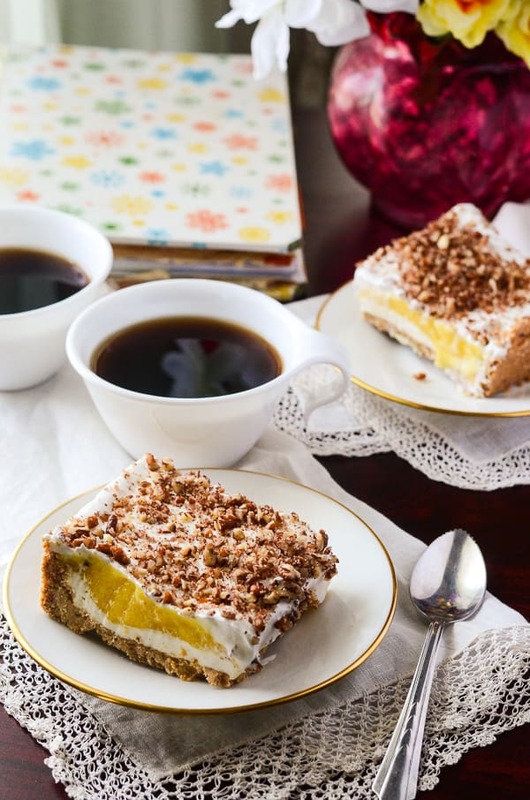 It’s a simple dessert, involving very little baking or labor, that is a delightful end to a meal, and makes a mean breakfast dessert, too. I’m pretty sure my Nana came up with the original concept of YOLO. And I couldn’t be happier to share her zest for life, and food, myself. This Million Dollar Cake is a light, refreshing cheesecake-style pudding cake, pulled from Nana's handwritten vintage cookbook! 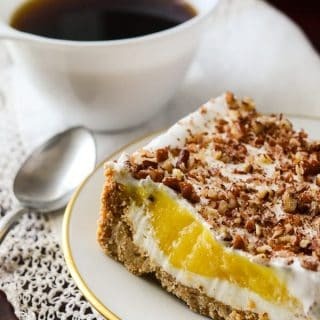 A buttery, nutty crust, easy vanilla pudding, and a cheesecake-based cream make up the delicious layer of this old-fashioned dessert. Preheat oven to 350 degrees F. In a large bowl, mix crust ingredients together until incorporated. 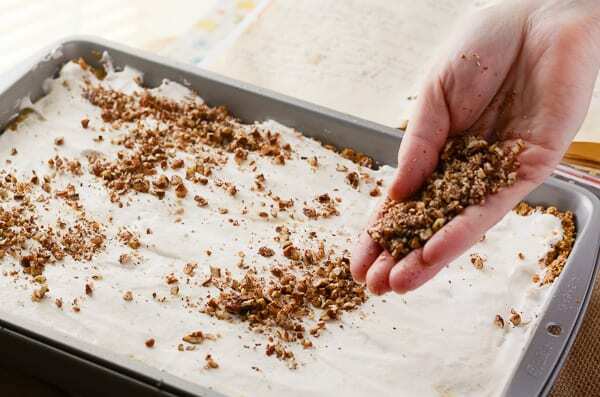 Transfer to a 9x13-inch baking pan, and press out to fill pan, allowing crust to creep about halfway up the edges. Bake for 20 minutes, then allow to cool completely before filling. In a clean bowl, beat cream cheese, 1 cup of whipped cream, and sugar together with a hand mixer. Pour filling into cooled crust and spread evenly. In another bowl, mix pudding mix and milk together until it begins to thicken, about 4-5 minutes. Pour on top of cheesecake layer and spread evenly. Top pudding layer with remaining whipped cream, and sprinkle with more crushed nuts. Refrigerate at least 3 hours before serving. Enjoy with a hot cup of coffee after dinner! Take a look at the rest of the #SundaySupper crew in action with some of their vintage recipes! Let me wipe away the tears long enough to thank you for sharing your great grandma with us today. How lucky are you to have a handmade cookbook containing her recipes? That is a million dollar cake and your memories are worth twice that. Thank you so much, Wendy. I’m so glad I hung on to it – I need to get crackin’ on making the recipes out of it! The pages are definitely worn, especially her Christmas cookie section! Your Nana sounds like she was a wonderful woman. And her cake looks marvelous!!! This was a lovely tribute to your Nana! What a special woman to have had in your life as you grew up. 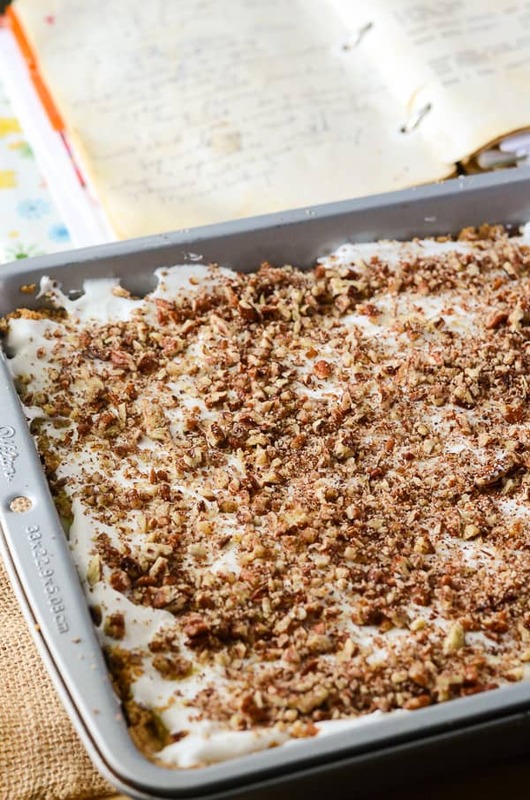 This recipe looks wonderful, I’m sure she’d be thrilled you shared it today. Your Nana sounds very special. I’m sure she knew how much she meant to you, though I often wonder if my Granny knows how much I loved her. We just have to trust that they do. Absolutely, Laura – you’re right, I’m sure they know! Such wonderful memories you have of your Nana and her cake looks AMAZING! I can’t wait to try it! I love this post! It gave me the chills. Up until about 5 years ago, I was incredibly blessed to still have ALL FOUR of my grandparents in my life. Now I only have one, and I cherish our time together. I love, love, love the photos of the cookbook and the picture with your Nana in the background. Gives me all the feels! What a sweet tribute to your Nana for Grandparents Day. I love that you included her photo next to that delicious looking cake! Your Nana sounded like a very special person. This cake is a wonderful tribute! What a special bond you had with your Nana. 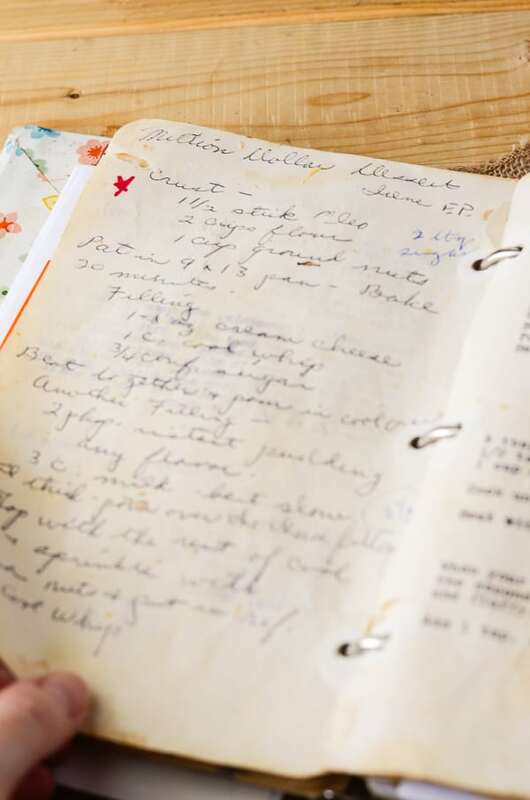 And her cookbook is definitely a treasure – I love her handwriting! This looks just like its name suggests!